A Venn-Tastic Quiz Format to Ensure Detailed Venn Diagrams! 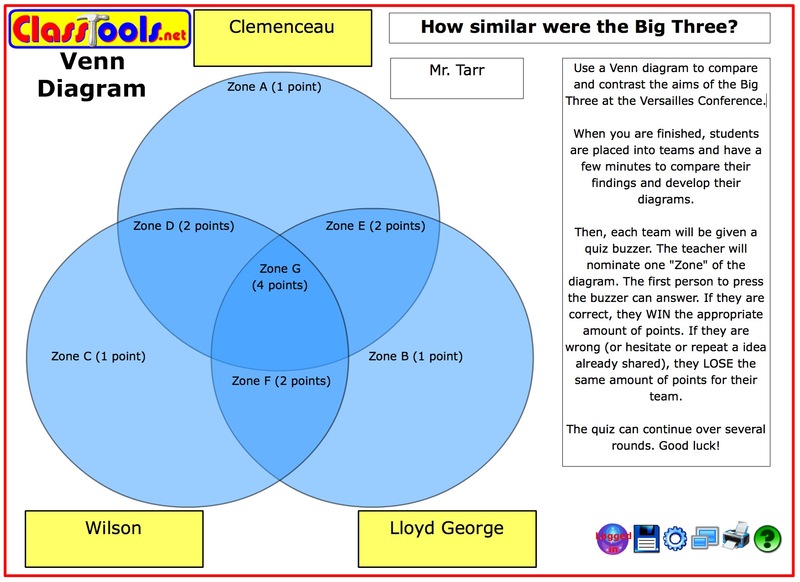 This is a simple but effective revision quiz based around any lesson or activity which makes use of Venn Diagrams, and it is a great way of ensuring that students create plenty of detail within their diagrams. The picture to the right shows students busy collaborating in preparation for the Venn Quiz. The rules are very simple. Once the students have completed their work, they are put into teams and have a few minutes to compare their findings and develop their diagrams. Then, each team will be given an answer buzzer. The teacher will nominate one “Zone” of the diagram. The first person to press the buzzer can answer by providing a relevant point that fits into that section of the diagram. If they are correct, they WIN for their team the appropriate amount of points for their team as indicated in the example below. If they are wrong (or hesitate or repeat a idea already shared), they LOSE the same amount of points for their team. The quiz can continue over several rounds. The end result is that all the students end up with a detailed resource for revision purposes or for the write-up phase of the project.